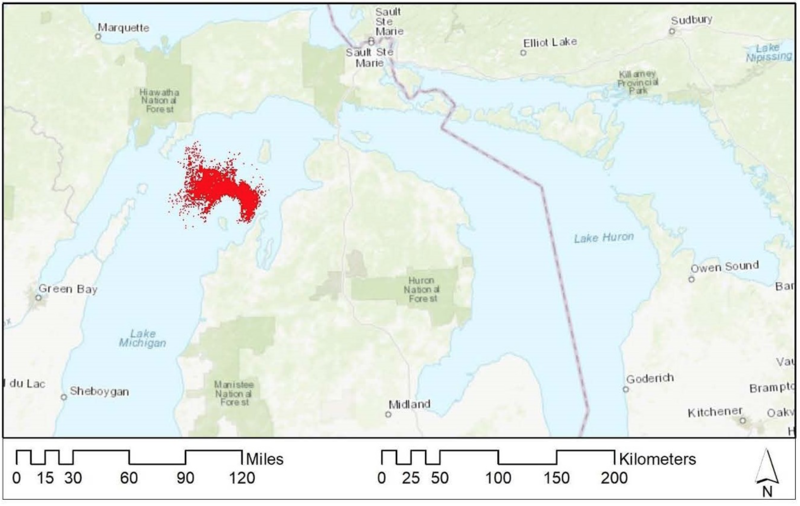 The State of Michigan conducted an independent, third party Risk Analysis for the 4.6 mile stretch of Enbridge’s Line 5 located in the Straits of Mackinac. 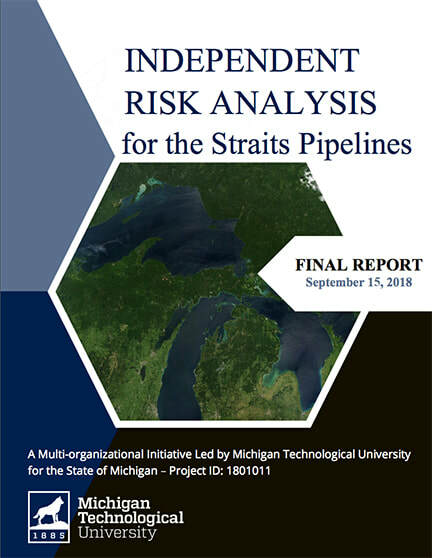 A Independent Risk Analysis for the Straits Pipelines was developed by a team led by Michigan Technological University and directed by professor Guy Meadows of Michigan Tech’s Great Lakes Research Center. The team included 42 Researchers from nine universities, seven located in Michigan – UM, MSU, WSU, WMU, GVSU, OU, and MTU – and two outside Michigan – NDSU and LUC, as well as three consultant organizations, two independent contractors (former DoE and AFPM), and the National Oceanic and Atmospheric Administration’s Great Lakes Environmental Research Laboratory (GLERL). 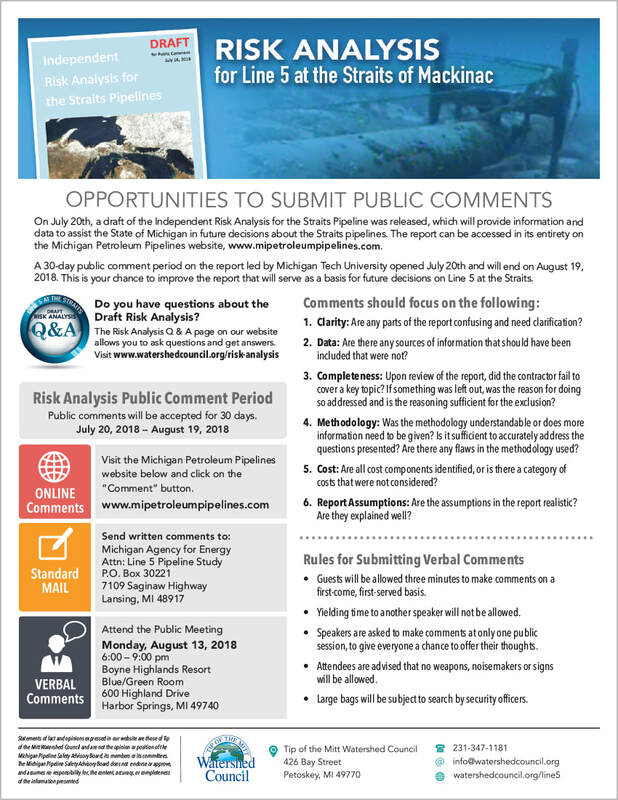 The report can be accessed in its entirety on the Michigan Petroleum Pipelines website, www.mipetroleumpipelines.com. 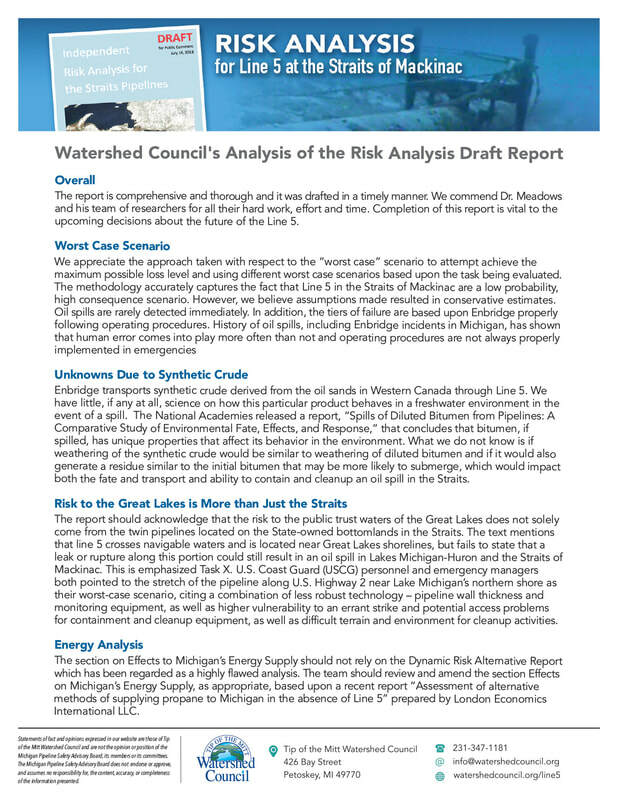 The analysis evaluates Enbridge’s liability for a worst-case-scenario pipeline spill including the impact such a spill would have on Michigan’s economy and environment. 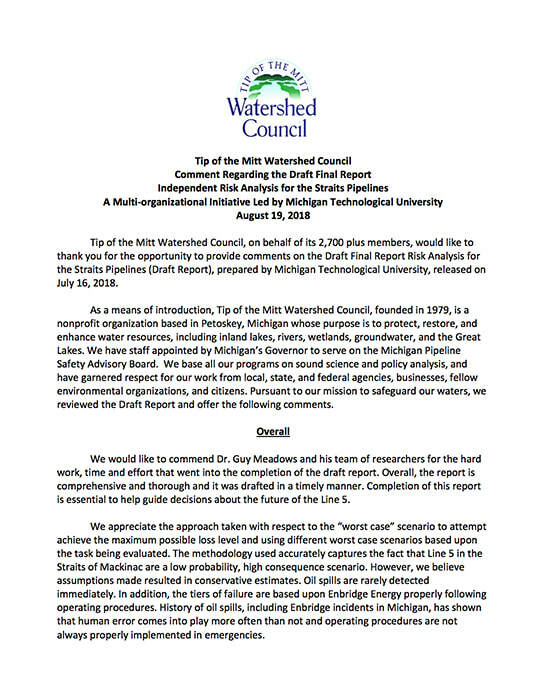 The risk analysis will help inform a decision by the State on the final disposition of Line 5. A final report was submitted to the state on September 15, 2018. 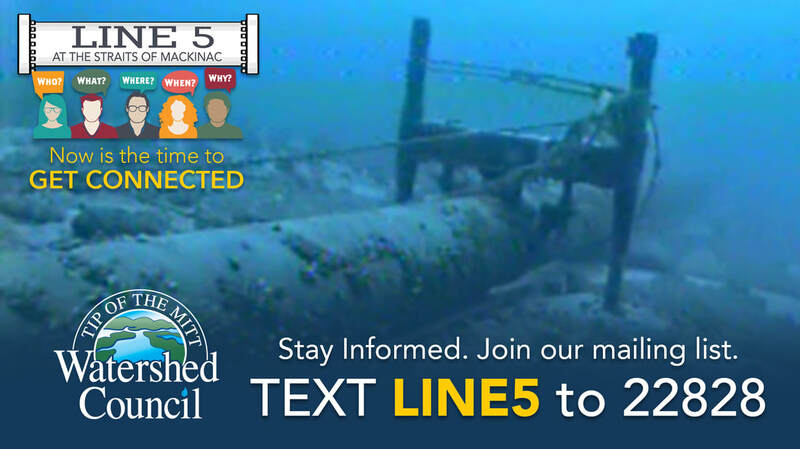 The final decision on the future of Line 5 is expected by October 1, 2018. 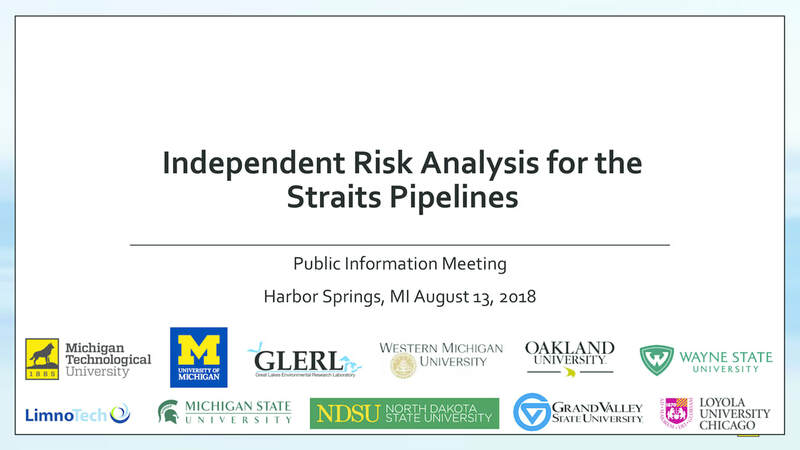 Objective: The 1953 Straits Pipelines Easement makes Enbridge liable for all damages or losses to public or private property resulting from its operations at the Straits. It also requires Enbridge to maintain insurance or other financial assurance acceptable to the State covering its liability. An independent analysis by qualified experts of the consequences of a worst-case scenario spill is needed to establish the amount of the required financial assurance and to help guide decisions about the future of the Pipeline. Identifying a “worst case” spill or release. In general, Lake Huron shorelines are predicted to be at the greatest risk of oiling. 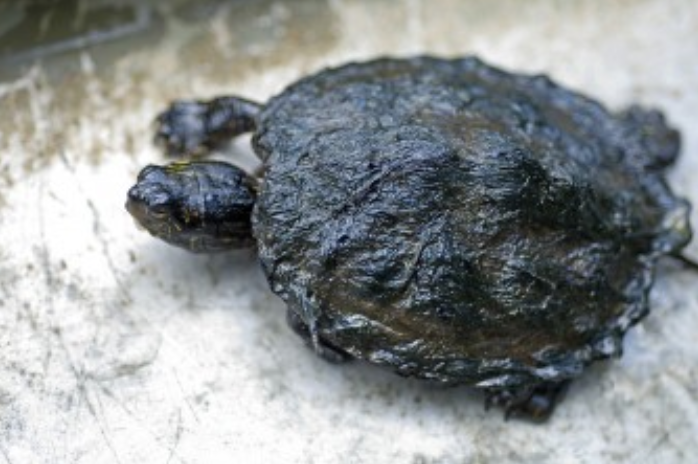 In June, July, August and October, the model predictions indicated oil beached oil along Lake Huron shorelines. 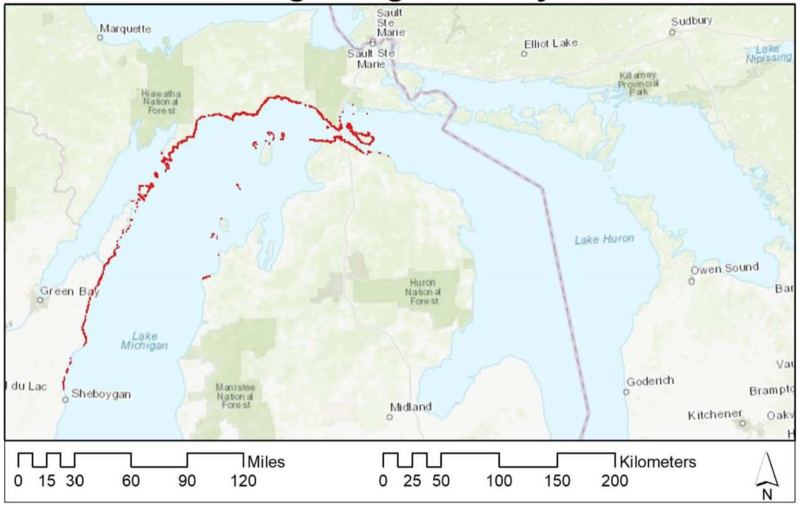 The maximum extent of shoreline oiling (km) predicted for the Straits of Mackinac and adjacent Lake Michigan and Huron regions as associated with the meteorological, ice cover and water current conditions observed for February. Results depicted represent a total oiled shoreline distance of 711 km following an oil release date and time of 02/28/2016 at 1200 hrs from the central pipeline release point and a total dispersal simulation time of 60 days. ​Lake Michigan coastline predicted to have 567 km of total oiled shoreline and Lake Huron 144 km. Majority of simulations predict oils spreads mainly to Lake Huron surface waters – January, May, June, July, August, September, November and December. ​The maximum extent of surface area oiling (km2) predicted for the Straits of Mackinac and adjacent Lake Michigan and Huron regions as associated with the meteorological, ice cover and water current conditions observed for April. Results depicted above represent a total surface area of 1745 km2 following an oil release date and time of 04/24/2016 at 1200hrs from the northern pipeline release point and a total dispersal simulation time of 30 days. Analysis indicates that in every month there are conditions under which recovery of oil would not be possible due to wind and wave conditions. Drinking Water: Public supplies and private drinking water wells would be at risk of oil contamination. However, the underground water flows towards the lake making the risk relatively low. 40 fish species including threatened and endangered Burbot, Coho, Chinook, Rainbow Trout, Long-Nose Sucker, Channel Darter, Pugnose Shiner, Cisco, and Lake Sturgeon. Fish that are bottom dwellers and fish in the near shore littoral zone will have higher exposure and more health impacts. Eggs and larvae will suffer the highest mortalities and longer-term populations level decreases resulting from a reduction in survival. Clarity: Are any parts of the report confusing and need clarification? Data: Are there any sources of information that should have been included that were not? Completeness: Upon review of the report, did the contractor fail to cover a key topic? If something was left out, was the reason for doing so addressed and is the reasoning sufficient for the exclusion? Methodology: Was the methodology understandable or does more information need to be given? Is it sufficient to accurately address the questions presented? Are there any flaws in the methodology used? Cost: Are all cost components identified, or is there a category of costs that were not considered? Report Assumptions: Are the assumptions in the report realistic? Are they explained well?